Seattle Area Hotel's Near the Sea-Tac AirportOnly 15 miles from downtown Seattle, the Holiday Inn Express & Suites Seattle Sea-Tac Airport hotel maintains a tranquil and modern setting for business and leisure guests, while providing convenient access to some of the top attractions and corporations in Seattle.Lodging with us on business ensures that you'll have the best when it comes to technical accommodations. 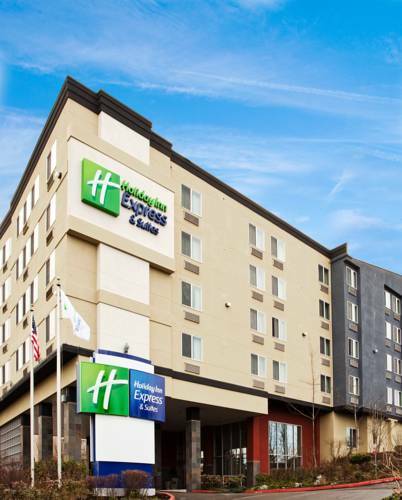 A well-equipped Business Center lets you print documents and boarding passes, and complimentary high-speed Internet access lets you surf the Web throughout the entire hotel. If you're planning a meeting or event, you'll be glad to know we offer 1,068 sq ft of meeting space that can accommodate up to 88 guests. Our catering services aim to please, with boxed lunch or buffet options to keep your appetite satisfied.Our hotel's not only near the Sea-Tac Airport, but also just minutes from a variety of fantastic downtown Seattle attractions. From Westlake Center to Pacific Place, shopping destinations abound around the area. Be sure to check out the Pike Place Market and the famous Space Needle in downtown Seattle, too.When lodging with us at the Holiday Inn Express & Suites Seattle Sea-Tac Airport , you can take advantage of such useful amenities as the Fitness Center and convenience store, as well as a complimentary, hot breakfast each morning. "Stay Smart" when you stay with us we look forward to seeing you!